Above is the circuit Diagram for this TDA2030 based Amplifier Circuit. We have connected a 2.2uf capacitor in series to the non-inverting pin of the TDA2030, here it is acting as the High Pass Filter. So that it allows only the high frequency audio signal. There is a resistor (R4) between pin 2 and 4 we called that resistor as Feedback Resistor. This feedback resistor is used to obtain the gain. If the feedback resistor is improper then the subwoofer amplifier will not work properly. In the circuit diagram, resistor (R1) and a capacitor (C2) are connected in series, with pin 2 of the TDA 2030 to suppress the noises in the audio signal. Pin 3 is grounded, means connected to negative terminal of power supply. The output of the TDA2030 is connected with the series capacitor of the value 2200uf to allow amplified signal to the speaker. The pin 5 is having a resistor of 100k which functioned as the voltage divider biasing. This sub-woofer circuit has the capacity to deliver 12 W output. We can we can use speaker of 4 to 6 ohm speaker. It will be better if we use a heat sink to remove the high temperature in the TDA 2030. If necessary you can also add a cooling fan for the better working. For the volume adjustment we are using 22 kilo ohm variable resistor. 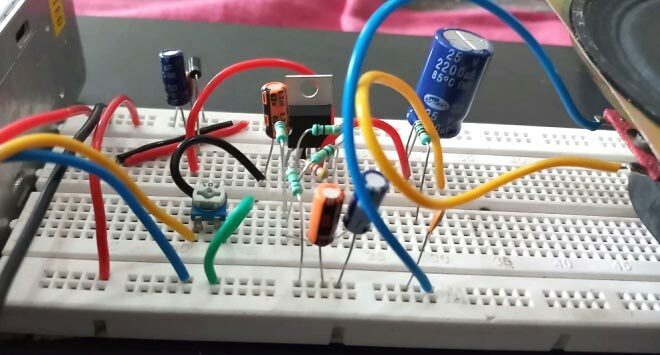 Connect the audio signal wire to the any one end of the variable resistor and connect the center pin to the input signal C1 of the capacitor. And connect the ground to the other end of the variable resistor. By changing the variable resistor we can change the volume of the subwoofer of td2030. IN4007 diode is used to avoid interchange of polarity of IC to avoid from burning and two capacitors C7 and C6 are used to eliminate the noises present in the power supply. The resistor R6 and C5 are also helps to avoid the unwanted the noises in the speaker (Blur sounds). I used 12v smps as power supply to power the entire circuit. For Connecting the 3.5mm Audio jack, Solder one wire to the stereo jack ground pin and one wire to either left or right pin. In below picture blue wire is ground and yellow wire is audio signal. Then connect the audio jack to mobile or laptop to enjoy music. So this is how, we can easily build the Subwoofer amplifier circuit using TDA2030. 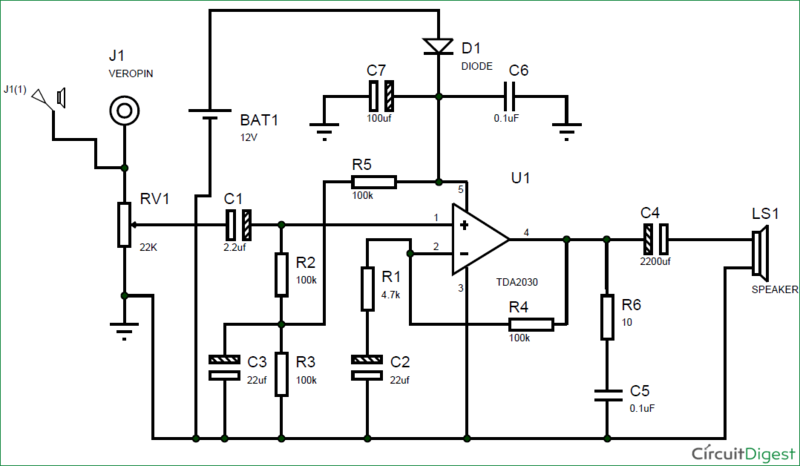 Below is the Demonstration Video for this amplifier circuit. good performance in electronic project , Never give up!!! I made it but the sound is very very low. please anyone give the solution of this problem. Sir i make this circuit but sound is too low .can it be increase by tda2822 as pre apmlifier? Sir Can i use TDA2030L?